Location: Sandal Magna, Wakefield, West Yorkshire, England. Ownership / Access: Castle open to public. Notes: Sandal Castle is a ruined medieval castle in Sandal Magna, a suburb of the city of Wakefield in West Yorkshire, overlooking the River Calder. It was the site of royal intrigue and the setting for the opening scene of one of William Shakespeare's plays. The castles built by William the Conqueror's followers were self-sufficient strongholds, some of which were tax-gathering points, some controlled the larger towns, river crossings or passes through hills. 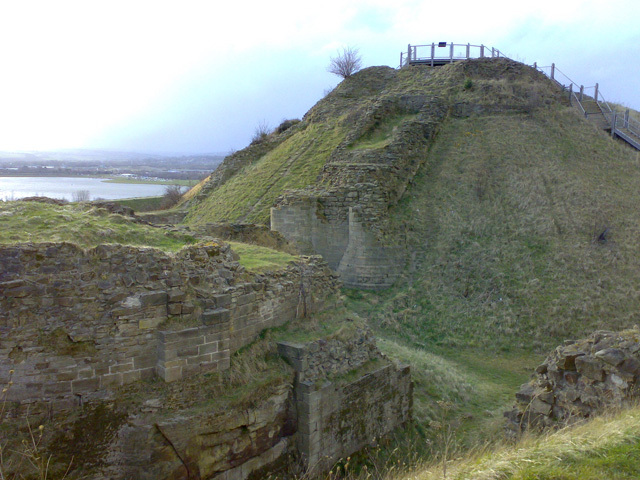 Two castles were built near Wakefield, one at Lowe Hill on the north bank of the Calder and Sandal on the south bank. The first castles were probably started and completed in the early 12th century by William de Warenne, 2nd Earl of Surrey after he had been granted the manor of Wakefield by Henry I. Sandal and Lowe Hill were motte-and-bailey earthwork castles with wooden towers on the mound and baileys with timber palisades and deep ditches. Sandal is built on a natural sandstone ridge, the Oaks Rock. The motte was raised to 10 metres (33 ft) with the 7 metres (23 ft) deep moat surrounding it. Only Sandal survived and during the 13th century the keep, curtain wall and other buildings were rebuilt in stone probably started by either the sixth or seventh Earls Warenne. Timber motte and bailey castles were often converted into stone if they were in use for long periods; Sandal is a particularly good example of this. The stone keep was circular with four towers each four storeys high; two of them close together formed a gatehouse, and the east tower contained a well, 37 metres (121 ft) deep. The double-walled keep would have had guardrooms, storerooms and servants' quarters on the ground floor, the main hall above and private apartments on the second floor. The tower rooms had garderobes, (lavatories) that discharged on the outer walls of the keep. The curtain wall was 6 metres (20 ft) feet high with a wall walk along its length, it enclosed the bailey and crossed the moat twice to reach the keep. The barbican at Sandal was inside the bailey, it was a three storey tower with a moat opposite two drum towers at the entrance to the keep all of which were constructed in the early 1270s. The barbican with its own gate and portcullis added an extra line of defence between the main entrance gate and the keep. Attackers entering the barbican had to make a right angled turn to enter the keep which was protected by a drawbridge between the drum towers. A stairway from the barbican led to a sally port, a hidden entrance near the moat from which surprise attacks could be made. The bailey lay to the south east of the keep with the main gatehouse on the north east side. It was crescent shaped, about 71 metres (233 ft) long and 52 metres (171 ft) wide. Inside the bailey there was a 12 metres (39 ft) deep well and two privy shafts, one of which is 8 metres (26 ft) deep.Shakespeare's play Henry VI, Part 3 (Act 1, Scene 2) is set in Sandal Castle. It describes Richard's sons urging him to take the crown before news is brought of Margaret's approach. Act 1, scene 4 then depicts the death of Richard at the Queen's hands. This brief fictionalised account bears little resemblance to the history as we understand it today. The play is sometimes performed on the castle ruins.